I’m in Lamu for the launch of building phase of The FlipFlopi project. The symbolic moment that the "idea" of building a boat entirely from recycled beach waste, has turned into an actual "thing". I got here this afternoon and decided to go on a run down the beach to see what I could find. I got past all the sunbathers, sunset strollers and around the fort onto the big long beach that stretches 12kms round to Kizingo at the other end. We did a beach clean-up on this exact section back in September 2016 where about 50 of us collected 5 tonnes of plastic in a little over 3 hours – so I was interested to see how much had returned. The answer is, plenty! As soon as I was away from the section that is cleaned by the good people of Peponi Hotel and the Shela Environment Group – the beach plastic came quick and fast and I ran. ... I always get ideas when I run. It’s when I scheme and dream… and this is what I thought up. One of the most commonly found bits of plastic on the beach was plastic bottle tops. I ran past literally thousands of them. (Further down this post you can see some them arranged below in a pretty pattern by Katharina to display at our launch event.) Brands are always so proud of their creations that invariably they put their logos or names on all they produce. Bottletops are no different. The only problem was that I didn't recognize many of the logos or brand names, plus some were in a different alphabet too - most likely from S.E. Asia. And this is where #bottletopbingo comes in. 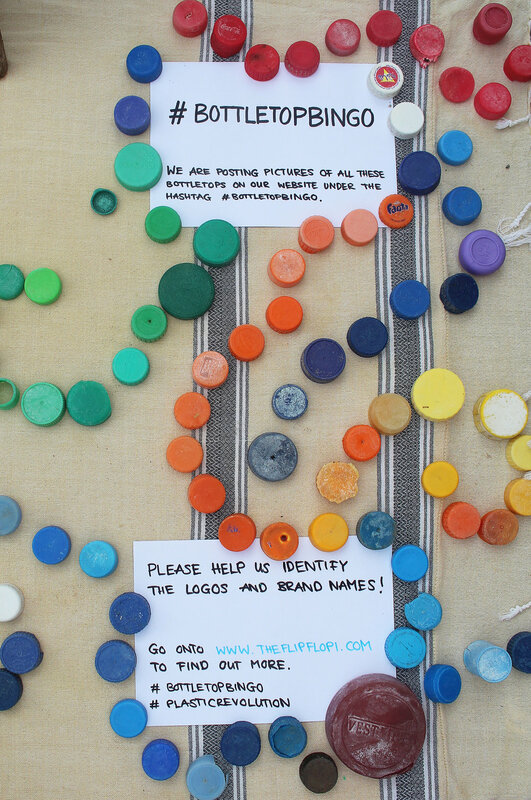 I have posted photos on instagram of all the bottletops I found - if you can help by identifying who the brands are - then the Flipflopi team will promise to send the companies in question a friendly letter asking them to join in efforts to stop this happening. Here is the letter that we'll send them - plus somewhere on our site we'll make sure we publish a list of everyone we've reached out to... together, of course, with any interesting replies we get. ... so please now go out and play #BottleTopBingo where-ever you live, work or play. Whether its Nairobi, New York, Nanyuki or Nepal... if you see a plastic bottletop lying around with brand name or logo - take a picture and get involved. If enough of us do this, it will get positive results... I promise you that! "Please help identify the company who made this, by posting a link to their website. When you do, The Flipflopi Project (www.theflipflopi.com) promise to send them a letter asking them to take steps to reduce plastic pollution." Thats all you need to do. The last step is something that WE will do.. Step 3. On your behalf The Flipflopi team will send our letter to all companies that are identified.